The town of Darke Peak, originally proclaimed on 4 June 1914 as Carappee, was renamed on 19 September 1940 after John Charles Darke, who had explored the area in 1844. Ten years later A.H. King and J. Hamp came across Darke’s grave while droving. From then on the area was settled by pastoralists, railway men, itinerant workers and some very interesting characters. This last group was made up of mostly people who preferred their own company rather than that of others. This changed to some extent when the dog fence was built between 1901 and 1903 and after the Hundred of Darke and the town of Darke Peak were surveyed in 1912. When surveyed into smaller farming blocks, early settlers came from as far away as Adelaide and Broken Hill. The first land sales were held in October 1913 and after these were finalized they came overland by bullock team, train or by boat from Port Lincoln, Cowell or Arno Bay. They had to bring everything they needed, household goods, furniture and tools; just as the early settlers had done 60 years earlier when they moved beyond Adelaide or the Barossa Valley. They lived in tents or any other available shelter. Although it was hard and primitive they had at least one advantage which the other settlers sixty years ago did not have. This time the government had made available water storage tanks on each block and also provided some dams for storage. The very first government tank had been constructed in 1911. Around 1920 a reservoir was built at Carappee Hill and is now supplied from the Polda Basin. The narrow gauge railway reached Darke Peak from Port Lincoln in 1911. Water for its steam engines came from the local dam constructed by Charles Frederic Ridgeway. Travel was tantalizingly slow but it did bring small supplies and the mail. Postal facilities were started on 6 April 1914 with Alexander Bruce as official Receiving Officer. On 1 September 1915 it became an official Post Office. No sooner had the farmers arrived than the hard job of scrub clearing had to be started. Until the first section was cleared and a crop sown, living conditions remained spartan. As 1914 was a drought year the resulting harvest was very poor and many families survived on kangaroo or rabbit, often referred to as underground mutton. Although used extensively for human consumption, rabbits were, and remained for a long time, a great pest and many different solutions were applied to get rid of them. Scrub clearing remained for several years an arduous job. Some of it was done by logging, also known as Mullenizing, cutting and burning. Many obstacles remained and it was here that the ideas behind Smith’s stump jump plough earned its stripes. Other ideas, machines and improvements were the locally produced Wake Rake, developed by Dave Wake of Darke Peak, Ridley’s Harvester or Stripper and several others. Most transport in the early days of settlement was by bullock, horse or camel. They were slowly replaced by track tractors. With the influx of more farmers and other settlers, shopkeepers soon established themselves in the town. Among the early ones were H.S. Pearce and Catherine Clarke who replaced Pearce in the 1920s and sold out in the 1930s to E.C. Slater. During these years the town was also served by commercial travellers and hawkers. Two of the best known being Afghans Bhola Shah and Sunda Singh. An interesting difference from other early settlements and Darke Peak was that it did not have a church building or even a hotel within a short time of the town being opened. They were often the first buildings to be erected. Although religion was practiced and services held, they mostly occurred in private homes. The first Methodist Service was held in the home of J.B. Davis in 1915. When farmers, who had relied mainly on cereal growing in the early years, were faced with drought they often looked at other forms of income. It was soon established that mixed farming, sheep raising and wheat growing could complement each other. Others would operate a blacksmith shop in competition with WW Wake, who was a professional blacksmith. Sport was played by many of the locals and within a few years clubs were formed to make it possible to play organized sports. The first official Football match was played in August 1915. Darke Peak School August 1933. The Darke Peak School was opened on 24 July 1917 with Denis Bagley as its first teacher. 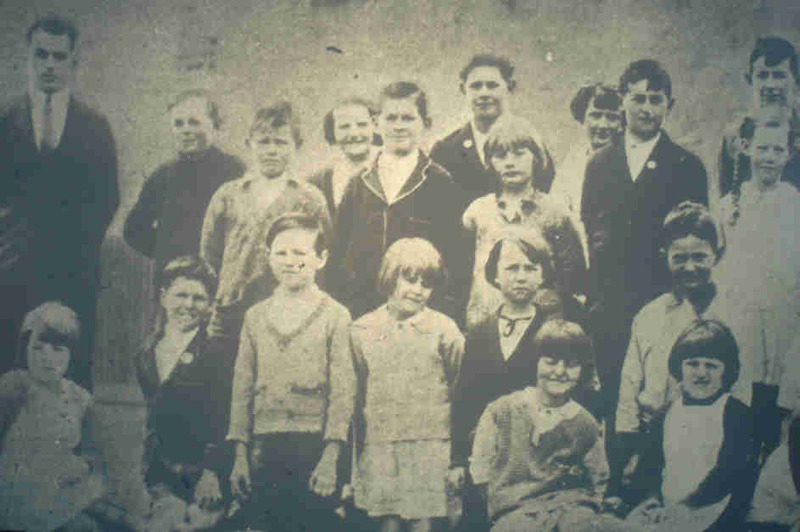 Among its first students were children from the Boehm, Davis, Hodge, Hutchins, Reid and O’Connor families. Ten years later they were those of the Wake, Goddard, Simes, Noble and Humphries families. As early as 1916 the town had its own Vigilance Committee. In October of that year it was decided to buy a block of land for an Institute building. It was opened in 1919. Two years later the Darke Peak Agricultural Bureau was formed. In February 1934 the Institute hall was decorated to celebrate the wedding between Harold V. Noble and Violet D. Goddard. About 70 guests attended the reception. The Darke Peak Hotel was completed in 1937. Its first licensee was William James Rickwood who had previously run the Colton Hotel. He remained the landlord until 1944 when Francis Joseph Donnelly took over.